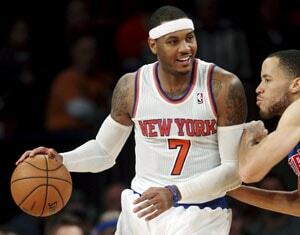 Carmelo Anthony scored 29 points as the New York Knicks ended a two-game losing streak with a 121-100 victory over the Detroit Pistons in the NBA on Sunday. Steve Novak added a season-high 18 and JR Smith had 15 points and 10 rebounds for the Knicks, who had started the season 6-0 before dropping consecutive games to the Memphis Grizzlies and Houston Rockets. Brandon Knight scored 21 points and Charlie Villanueva had 17 for the Pistons, who have lost six straight games at Madison Square Garden. The San Antonio Spurs got 32 points from Tony Parker and 26 from Tim Duncan to defeat the Toronto Raptors in double overtime 111-106. Parker scored six of his points in the second overtime as the Spurs won their third straight game and improved their NBA-best road record to 7-1. DeMar DeRozan scored 29 points and Lithuanian rookie Jonas Valanciunas added 22 for the Raptors, who have lost their past three games by a combined seven points. The Brooklyn Nets beat the Portland Trail Blazers 98-85 for their fifth straight win at their new home in Brooklyn. The Nets have won six of their first seven games on their new home court - the team's best start since the 2002-03 season when they won 18 of their first 19 at home. Deron Williams had 15 points, 12 assists, four blocked shots and three steals to lead Brooklyn, while Joe Johnson added 21 points and Brook Lopez had 15. The Boston Celtics outlasted the Orlando Magic 116-110 in overtime after trailing by as many as seven in the fourth quarter. The Celtics were led by Kevin Garnett's 24 points and Paul Pierce's 23, while Rajon Rondo was one rebound shy of a triple double with 15 points, 16 assists and nine rebounds. The Celtics won their second straight and earned their sixth consecutive win over the Magic, who got 21 points from J.J. Redick and 20 from Jameer Nelson. The Philadelphia 76ers ended a two-game losing streak by edging the Phoenix Suns 104-101. Jrue Holiday led the Sixers with a career-high 33 points and 13 assists, while Evan Turner added 16 points, Lavoy Allen had 11 and Thaddeus Young 10. Kenneth Faried had his eighth double-double of the season with 14 points and 12 rebounds as the Denver Nuggets routed the New Orleans Hornets 102-84. Andre Iguodala led the Nuggets with 23 points, while Ty Lawson had 17 points and six assists.